The 5 balls of life speech by Coca-Cola’s former CEO Brian Dyson (1986-1991) is one of the most viral speeches circulating on the web. Very much in line with Apple founder Steve Jobs’ announcement speech at Stanford University, Dyson addresses the priorities in life using the metaphor of juggling 5 balls. He calls the balls work, family, friends, health and spirit. Bryan Dyson’s speech has reached such fame that multiple versions are circulating through the web: some “extended Director’s cut” versions are aimed to make his inspiring original speech sound even more inspiring, some have called Dyson’s address one of the most famous short speeches, and others tagged it as the 30 second speech. You can even find different dates when the speech is supposed to have been given. Truth is that Bryan Dyson really did deliver his short speech about life, friendship, love and family at the 172nd commencement of the Georgia Tech Institute, on September 6, 1991. Mark Turner did the effort to track the origins of Bryan Dyson’s speech down to its roots. But the speech is neither short nor lasted 30 seconds only. The 5 balls of life metaphor is the closing part of a full 1634 words long commencement speech. Turner found Dyson’s original speech in Georgia Tech’s newspaper archives (download full speech here (page 3)). […] Imagine life as a game in which you are juggling some five balls in the air. You name them work, family, health, friends and spirit. And you’re keeping all of these in the air. Bryan Dyson continues: “You live in a world of growing opportunity at one of the most exciting times in history, and you have been prepared with an exceptionally fine education. Because you are all so well educated, let me pose this final question to you. What is education for? Is it for the pursuit of knowledge or for the pursuit of significance? How you answer makes a difference. Brian Dyson was born in Argentina in 1936 and joined Coca-Cola in 1959, where he worked during several years in South America, the Caribbean Sea and Mexico. From 1978 to 1983, Dyson was president of Coca-Cola USA until he became president of Coca-Cola North America. From 1986 to 1991, he finally was the first president and CEO of the newly created Coca-Cola Enterprises Inc. I feel passionate about sharing Brian Dyson’s quotes and instructions on how to juggle 5 balls, because his speech popped into my life during a crucial phase, when I started reconsidering things. I was dedicating an average of 90 hours plus to an executive job in a project I had felt really passionate about. My passion for the job started to fade, and the dedication to my work happened at the extent of two of my personal values: family and love. I asked myself: How are 90 hours per week dedicated to my job compatible with being consciously present and enjoying my siblings, my wife and my friends? Dyson’s metaphor inspired me to take action before my family glass ball was severely damaged. 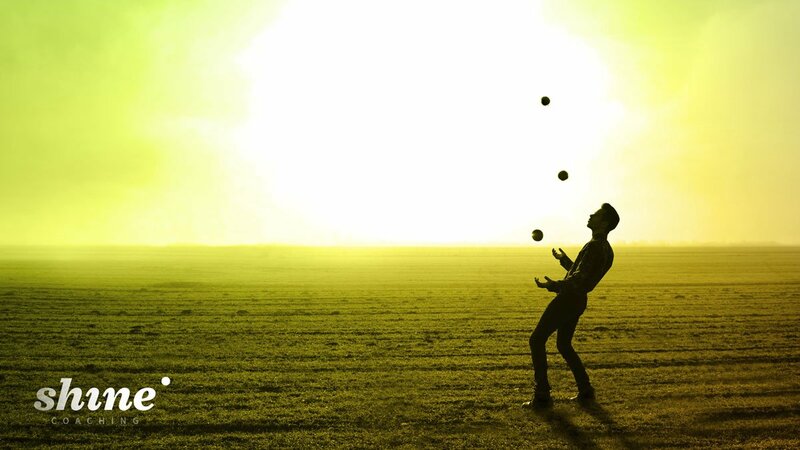 Since that decision, juggling the 5 balls of life is a personal mantra to me. Thank you, Mr. Dyson, for sharing your wise, inspiring words. If you find yourself at a similar point in life, consider doing a coaching process to get things on the right track. Contact us for more details how we can support you.